Saw this on the TUGSTER blog yesterday & thought it was a pretty cool shot showing the scale of both ship & truck. 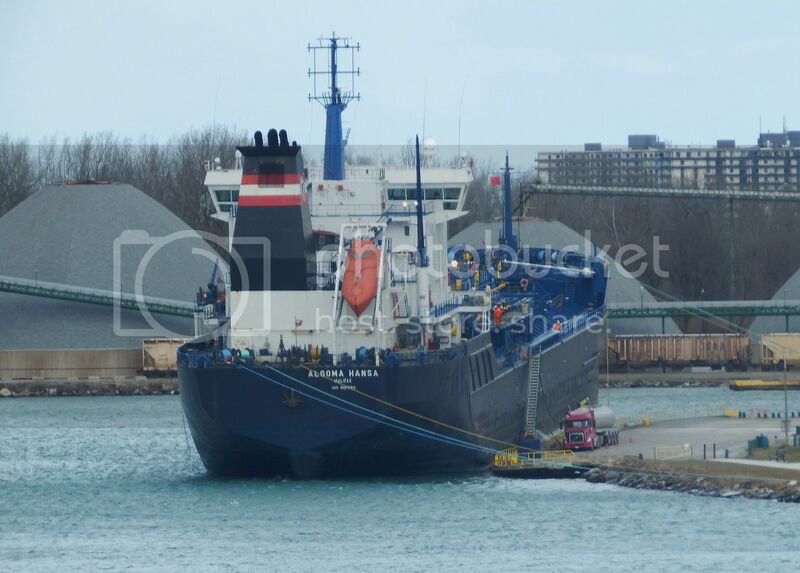 Algoma Hansa is the tanker at a dock in Sarnia ON...……..anyone recognize the company the Volvo belongs to? The ship looks so big in perspective but they look small compared to the other lakers plying the Great Lakes. You're right about perspective...……….the thousand footers make this one look small. Could it be a George Hall unit? I don't get the 1000 footers down here on Lake Ontario - the Welland Canal locks are 730 feet. Probably not Geo.A Hall but I would guess at Harold Marcus. Sarnia is in their territory. Excellent shot, wonder why it is down at the rear? Or is it just the zoom in that makes it look that way? I was going to guess Harold Marcus too. I wouldn't have a guess as to the carrier either, but that's a hell of a perspective. Thanks for sharing Charlie. Probably a ballasting issue while unloading/loading. Will be corrected before the ship sails.